For other people named Knut Rasmussen, see Knut Rasmussen (disambiguation). Knud Johan Victor Rasmussen (/ˈræsmʊsən/; 7 June 1879 – 21 December 1933) was a Greenlandic–Danish polar explorer and anthropologist. He has been called the "father of Eskimology" and was the first European to cross the Northwest Passage via dog sled. He remains well known in Greenland, Denmark and among Canadian Inuit. Rasmussen was born in Jakobshavn, Greenland, the son of a Danish missionary, the vicar Christian Rasmussen, and an Inuit–Danish mother, Lovise Rasmussen (née Fleischer). He had two siblings. Rasmussen spent his early years in Greenland among the Kalaallit where he learned to speak Kalaallisut, hunt, drive dog sleds and live in harsh Arctic conditions. "My playmates were native Greenlanders; from the earliest boyhood I played and worked with the hunters, so even the hardships of the most strenuous sledge-trips became pleasant routine for me." He went on his first expedition in 1902–1904, known as The Danish Literary Expedition, with Jørgen Brønlund, Harald Moltke and Ludvig Mylius-Erichsen, to examine Inuit culture. After returning home he went on a lecture circuit and wrote The People of the Polar North (1908), a combination travel journal and scholarly account of Inuit folklore. In 1908, he married Dagmar Andersen. In 1910, Rasmussen and friend Peter Freuchen established the Thule Trading Station at Cape York (Qaanaaq), Greenland, as a trading base. The name Thule was chosen because it was the most northerly trading post in the world, literally the "Ultima Thule". Thule Trading Station became the home base for a series of seven expeditions, known as the Thule Expeditions, between 1912 and 1933. The First Thule Expedition (1912, Rasmussen and Freuchen) aimed to test Robert Peary's claim that a channel divided Peary Land from Greenland. They proved this was not the case in a remarkable 1,000 kilometres (620 mi) journey across the inland ice that almost killed them. Clements Markham, president of the Royal Geographical Society, called the journey the "finest ever performed by dogs." Freuchen wrote personal accounts of this journey (and others) in Vagrant Viking (1953) and I Sailed with Rasmussen (1958). The Second Thule Expedition (1916–1918) was larger with a team of seven men, which set out to map a little-known area of Greenland's north coast. This journey was documented in Rasmussen's account Greenland by the Polar Sea (1921). The trip was beset with two fatalities, the only in Rasmussen's career, namely Thorild Wulff and Hendrik Olsen. The Third Thule Expedition (1919) was depot-laying for Roald Amundsen's polar drift in Maud. The Fourth Thule Expedition (1919–1920) was in east Greenland where Rasmussen spent several months collecting ethnographic data near Angmagssalik. 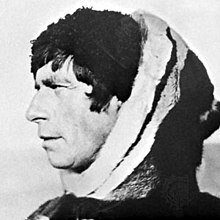 Rasmussen's "greatest achievement" was the massive Fifth Thule Expedition (1921–1924) which was designed to "attack the great primary problem of the origin of the Eskimo race." A ten volume account (The Fifth Thule Expedition 1921–1924 (1946)) of ethnographic, archaeological and biological data was collected, and many artifacts are still on display in museums in Denmark. The team of seven first went to eastern Arctic Canada where they began collecting specimens, taking interviews (including the shaman Aua, who told him of Uvavnuk), and excavating sites. Rasmussen left the team and traveled for 16 months with two Inuit hunters by dog sled across North America to Nome, Alaska – he tried to continue to Russia but his visa was refused. He was the first European to cross the Northwest Passage via dog sled. His journey is recounted in Across Arctic America (1927), considered today a classic of polar expedition literature. This trip has also been called the "Great Sled Journey" and was dramatized in the Canadian film The Journals of Knud Rasmussen (2006). For the next seven years Rasmussen traveled between Greenland and Denmark giving lectures and writing. In 1931, he went on the Sixth Thule Expedition, designed to consolidate Denmark's claim on a portion of eastern Greenland that was contested by Norway. The Seventh Thule Expedition (1933) was meant to continue the work of the sixth, but Rasmussen contracted pneumonia after an episode of food poisoning attributed to eating kiviaq, dying a few weeks later in Copenhagen at the age of 54. In addition to several capes and glaciers, Knud Rasmussen Range in Greenland is named after him. He was awarded an Honorary Fellowship from the American Geographical Society in 1912, and its Daly Medal in 1924. The Royal Geographical Society awarded him their Founder's Gold Medal in 1923 and the Royal Danish Geographical Society their Hans Egede Medal in 1924. He was made honorary doctor at the University of Copenhagen in 1924. ^ a b Alley, Sam. "Knud Johan Victor Rasmussen". Mankato: Minnesota State University. Archived from the original on 12 October 2010. Retrieved 23 November 2015. ^ a b c d e f g h i j k Elizabeth Cruwys, 2003. ^ a b c Knud Rasmussen, 1927, Across Arctic America, Introduction. ^ "Life and history:". ilumus.gl. Archived from the original on 2008-01-02. Retrieved 2008-01-06. ^ Freuchen, Dagmar (1960). Peter Freuchen's Adventures in the Arctic. New York: Messner. p. 21. ^ "Knud Rasmussen Land". Mapcarta. Retrieved 24 April 2016. Bown, Stephen R. White Eskimo: Knud Rasmussen's Fearless Journey into the Heart of the Arctic (Da Capo, 2015). xxvi, 341 pp. Wikimedia Commons has media related to Knud Rasmussen. Qaanaaq, formerly and still popularly known as Thule or New Thule, is the main town in the northern part of the Avannaata municipality in northwestern Greenland. 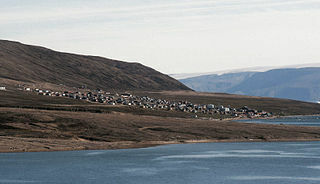 It is one of the northernmost towns in the world. The inhabitants of Qaanaaq speak Kalaallisut and Danish, and many also speak the Inuktun language. The town has a population of 656 as of 2013. 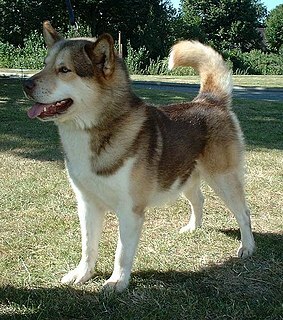 The Greenland Dog is a large breed of husky-type dog kept as a sled dog and for hunting polar bear and seal. They were brought from Siberia to North America by the Thule people 1,000 years ago, along with the Canadian Eskimo Dog that is genetically identical. The Canadian Eskimo Dog is an Arctic breed of working dog. Other names include qimmiq or qimmit. They were brought from Siberia to North America by the Thule people 1,000 years ago, along with the Greenland Dog that is genetically identical. The Journals of Knud Rasmussen is a 2006 Canadian-Danish film about the pressures on traditional Inuit shamanistic beliefs as documented by Knud Rasmussen during his travels across the Canadian Arctic in the 1920s. Produced by Isuma, the film was directed by Zacharias Kunuk, who also directed the award-winning Inuit film Atanarjuat: The Fast Runner, and Norman Cohn. It premiered on September 7, 2006 at the Toronto International Film Festival, after pre-release screenings in Inuit communities in Canada and Greenland. Lorenz Peter Elfred Freuchen was a Danish explorer, author, journalist and anthropologist. He is notable for his role in Arctic exploration, especially the Thule Expeditions. Inuktun is the language of approximately 1,000 indigenous Inughuit, inhabiting the world's northernmost settlements in Qaanaaq and the surrounding villages in northwestern Greenland. The Inughuit, historically Arctic Highlanders, are Greenlandic Inuit. Formerly known as "Polar Eskimos", they are the northernmost group of Inuit, and the world's northernmost people, living in Greenland. Inughuit make up about 1% of the population of Greenland. The Netsilik Inuit (Netsilingmiut) live predominantly in the communities of Kugaaruk and Gjoa Haven of the Kitikmeot Region, Nunavut and to a smaller extent in Taloyoak and the north Qikiqtaaluk Region. They were, in the early 20th century, among the last northern indigenous peoples to encounter missionaries from the south. Comer's Midden was a 1916 archaeological excavation site near Thule, north of Mt. Dundas in North Star Bay in northern Greenland. It is the find after which the Thule culture was named. The site was first excavated in 1916 by whaling Captain George Comer, ice master of the Crocker Land Expedition's relief team, and of members of Knud Rasmussen's Second Danish Thule Expedition who were in the area charting the North Greenland coast. Therkel Mathiassen was an archaeologist, anthropologist, cartographer, and ethnographer notable for his scientific study of the Arctic. Kaj Birket-Smith was a Danish philologist and anthropologist. He specialized in studying the habits and language of the Inuit and Eyak. He was a member of Knud Rasmussen's 1921 Thule expedition. In 1940, he became director of the Ethnographic Department of the National Museum of Denmark. Jean Malaurie is a French cultural anthropologist, geographer, physicist, and writer. This is a survey of the postage stamps and postal history of Greenland. Freuchen Land is a peninsula in far northwestern Greenland. It is a part of the Northeast Greenland National Park.